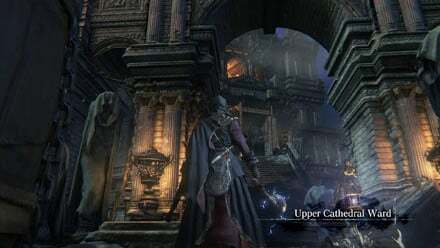 Upper Cathedral Ward is a location in Bloodborne. This is an area after Healing Church Workshop. Immobile Statue: Teaches Make Contact gesture. Not a real NPC per se though. 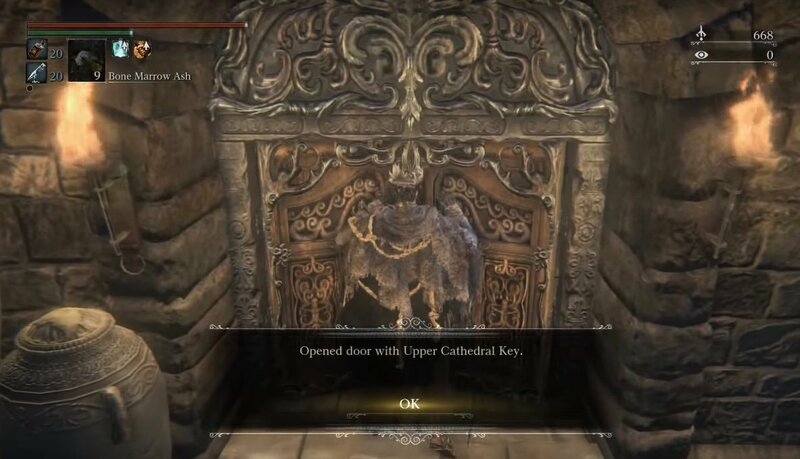 To access Upper Cathedral Ward you need to obtain the Upper Cathedral Key which is found in Yahar'gul, Unseen Village. When you have the key, head to the top of Healing Church Workshop and open the previously locked door. Proceed through, and the title should prompt, letting know you have arrived. When you first enter, head up the steps infront of you and kill the first Celestial Larvae enemy. Carry on heading up the stairs. You'll come to a gate and a bridge, pick up the Blue Elixir from the body at the gate then head down the bridge. Through the fog, two Church Servants will approach you. Up here they're stronger than down in the normal Cathedral Ward, so be careful, but engage them the same as you would any other time. You'll find the area lamp past them. Past the lamp, carry on up the stairs and you'll come out to a semi-circular area, patrolled by many Celestial Larvae. Go right first, kill your way through the group to pick up the Great Lake rune at the dead end. Head back and before continuing up the second set of stairs, the Carrion Crows to the side of them, guard a body with a Frenzied Coldblood(9). Once you've picked it up, head up the stairs. You'll see a bonfire ahead of you and another Church Servant at the top of the stairs. This one is carrying a pretty big flame imbued scythe, so watch out. If you pull him down the stairs you can get him to walk through the bonfire which can shave a bit of HP off him. No matter how you deal with him, head up the stairs and prepare to be quiet. At the top of the stairs you'll walk into a dark room with the unmistakeable sound of a Brainsucker. Creep up behind him and take him out. Make sure to pick up the Choir Set before you head out into the corridor. On the right you'll see a lootable body at the end of that corridor which holds a Madman's Knowledge. When you approach the body a Wolf Beast will burst through the window. 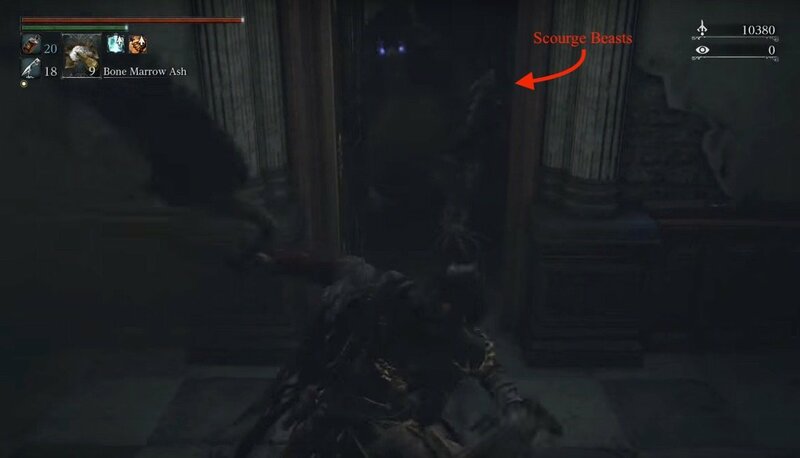 Note that he has blue eyes instead of the normal red, the Scourge Beasts in this area are amped up compared to those you've fought before, so be prepared to parry, backstep and if you need to, run into the room where the Brainsucker was as it can't get through the door. As you can't get through the door next to where the wolf burst in, head back to the other end of the corridor, open the door and you'll find yourself on a balcony above the main hall. When you head down the stairs three of the same variety of Scourge Beasts will fall from the ceiling and destroy the chandelier. As a jump scare, this works, as a device that makes the fight harder, it's even more effective as now there is very little light in the room. Try to pull the beasts one at a time. Alternatively, lure them to the door so they can't go through and cheese it. Patrolling on the left side of the room will be another Scourge Beast and around the right, you'll find a Brainsucker. Clear the area then head to the rear of the room on the right side. Going down the tight corridor here will net you the Cosmic Eye Watcher Badge, guarded by a Brainsucker. At the locked main door is a body with some Ritual Blood(5). Head back to the other side of the hall and head down the tight corridor with the Scurrying Beast at the end. DO NOT chase it. Hiding around the right corner is another Brainsucker; a good strategy to kill the Beast without losing insight, is to chuck a Molotov at it before it leaves the room. Head up the ladder when you've sorted this area out. When you reach the top of the ladder you'll be out on a balcony with a Brainsucker standing looking out over the room, which upon attacking, will lure another one out for an unfair battle. 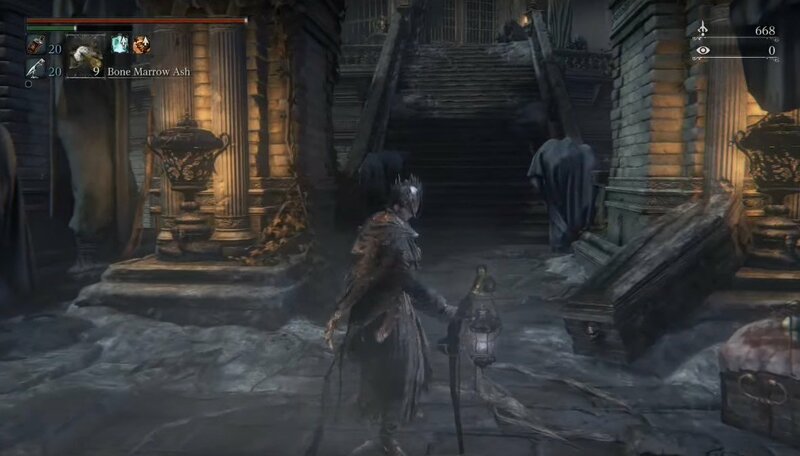 Killing them will cause one of them to drop the Orphanage Key.Take the stairs down to open a shortcut back to this point next to where the wolf beast burst in, then head back up. Open the doors on the balcony and you'll see a statue striking a pose. Interact with it and you'll learn the 'Make Contact' Gesture. For now, you're done here so head back down to the room you ended up in after climbing the ladder to find a bunch of goodies scattered across a hallway. This includes: Blue Elixir, Blindfold Cap, 2x Madman's Knowledge, and Pearl Slug. Continue down to the bottom of the hall. You can now open the enormous doors here. This leads to the next section: The Orphanage. I&apos;ll never forget my first time going through this area. Wind howling, the dried tree branches moving. Why is it called the orphanage? What are these little slugs-like things? Then the footsteps, schlurp schlurp noises, blue eyes glowing in the dark, that accursed shrieking when the brainsuckers grab you. And it filled with a cold, chilling note. i was so paranoid entering this place i did not like it one bit,and when the chandelier broke i panicked so bad lmao! i ran back out the door and said nope use the door to your advantage im not dealing with 6million different scourge beasts lol. The moment that you walk through the temple and suddenly the chandelier drops, howling in the distance, complete darkness and angry werewolves trying to rip you to shreds was one of the most Hunter moments in the game. I got chills, and it is so far my favorite "scene"
Better idea for the Wandering Madness: Instead of chasing it or wasting a molotov, just kill the Brainsucker, then quit and reload. No monsters respawn, and the Madness critter is back and safe to kill without using up resources unnecessarily. It&apos;s also safer. 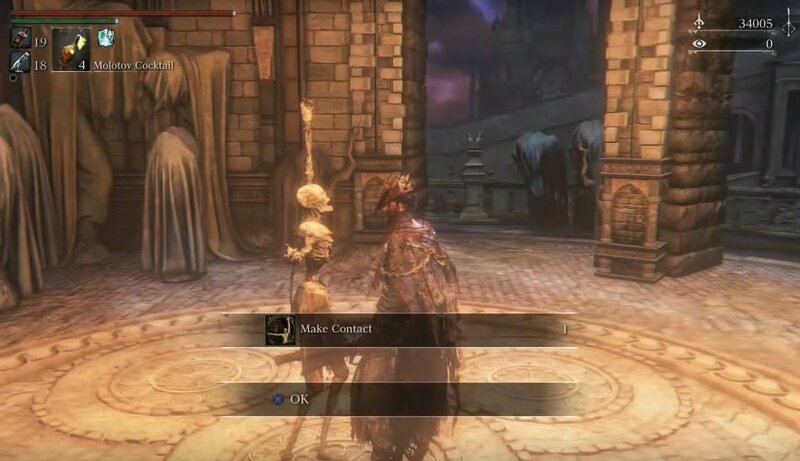 I can confirm - even after the patch, it&apos;s possible get the Orphanage key by attacking the brainsucker through the locked door. Use Threaded Cane in whip form. Roll at the door then use a transforming attack (L1). It will clip through the door and may or may not hit the sucker. Keep trying until it does. Once the sucker is drawn, KEEP GLUED TO THE DOOR AND IMMEDIATELY SWITCH OUT A WEP WITH A GOOD THRUST ATTACK. LUDWIG&apos;S GREATSWORD CHARED R2 IS BEST. Dont worry for the suckers attacks wont hit through the door. But u must hit him quickly otherwise he could lose interest and go back. Tiresome, I know, but it beats drudging through the corridor of nopes and getting your brain liquidated. Quick tip for anyone having difficulty with Brainsuckers, they are Very Weak to Thrust attacks, (everything kinda is but these fuckers take exponentially more damage from Thrust) so weapons like Ludwigs Holy Blade, Threaded Cane (Cane form) or Kirkhammer (Sword form) with R2 works very well. I know this is a pretty brutal section so I figured I&apos;d post a run-through for those of you who just want through it ASAP. No items or anything like that. Please note you will need threaded cane for this. Run up the stairs and turn left. Continue past crawling enemies until you hit another staircase. Go up and kill the enemy with big glowing scythe. Continue into building and down the stairs. Watch for brain sucker on left. Head through the door and turn right down a long hallway with an item at the end. Ignore this item as you will be ambushed by werewolf. At the end of the hall there is a locked door with a brain sucker on the other side. Use the r2 + forward attack with the threaded cane to get its&apos; attention. When it moves toward the door kill it with your upgraded weapon. Once it is dead it will drop orphanage key. Return back down the hall and look for a door on the right. Head through that and you will come to some stairs. Before you get to the bottom throw a blood cocktail to distract the wolves that drop on you. Head straight through the room and open the door then pull the lever to open the gate and return to lantern. Up the stairs in the gate room leads to celestial emissary. May the good blood guide your way. Can they please add a map I don&apos;t know where I am. or message me at kingtofu-the-9th I will also help you, of course. Anyone notice the trees alongside the initial bridge before the first lantern are kinda... off? I&apos;m fairly certain trees aren&apos;t supposed to move like that. If you&apos;re having trouble with the brainsuckers, the torch is very affective. Wiki says you need to kill 2 brainsuckers near the wolf for the key. False. Just kill the one closest to the wolf. Lost almost 20 insight to those stupid brain suckers and by the sound of some of the other comments I got off lucky. Whoever programmed them to spam that grab spell every half second needs to be punched in the face. There&apos;s a difference between tough and straight up bull*****.